TORONTO, ON – Black Oak Brewing has announced details of the next in a series of events that put the spotlight on guest breweries from all across Ontario. The N.S.E.W. Cask Series features four events happening at the brewery throughout 2018, each focused on OCB-member breweries from a different region of the province. 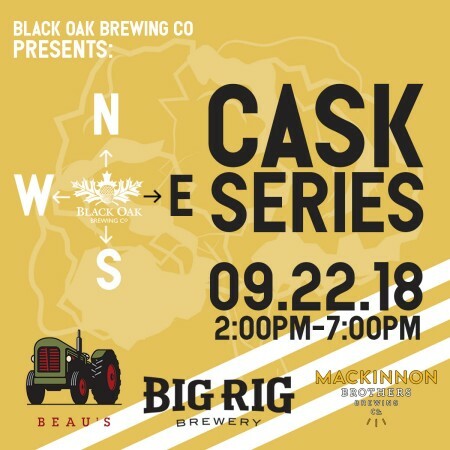 The third event in the series will take place on Saturday September 22nd from 2:00 to 7:00 PM, and will feature exclusive casks from breweries in the East, including Beau’s, Big Rig, County Durham, and MacKinnon Brothers. Admission to all N.S.E.W. Cask Series events is free, with drink tickets available for $5 each, and food from local businesses available to purchase. For more details and to RSVP for the East event, see the Eventbrite listing.